Freemasonry: Idolatry or Encourager of Idolatry? “From this day forth I am going to be a man of God; if that splits the church, then so be it. If the church wants to vote me out, then so be it. When I was 17, I prayed that God would make me a dangerous man for Jesus. I am publicly renewing that prayer today. Pastor, you and I know that one of the things blocking revival in this church . . . is Freemasonry.” —James Holly, to the congregation of Calvary Baptist Church. In the early 1990s, a Texas layman and medical doctor named James L. Holly brought the practice of Freemasonry to the forefront of Southern Baptist discourse. For months, Holly had been preparing and disseminating anti-Masonic tracts to Southern Baptist churches across the country. Being firmly convinced that the principles and rituals of Freemasonry made the Craft incompatible with the Christian faith, Holly proposed a resolution recommending a study of Freemasonry at the 1992 Southern Baptist Convention. Much controversy ensued. This was no surprise to Holly, who estimated that the Masonic membership of the Southern Baptist Convention was between 500,000 and 1,300,000. Southern Baptist polling indicated that 14 percent of pastors and 18 percent of church deacon chairmen interviewed were or had been Masonic lodge members. Over and against the proclamations of Holly, Masons sought to prove that the practice of Freemasonry was not incompatible with a Christian life. In response to the Southern Baptist investigation, Freemasons sought to provide apologetics for their activities. 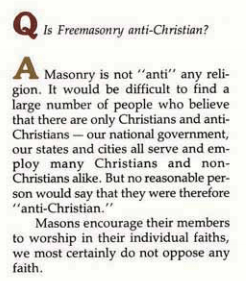 A number of such apologetics were printed in the February 1993 edition of The Northern Light, which heralds itself as “the premier magazine of Scottish Rite Masonry in America. This particular edition of The Northern Light is almost entirely dedicated to refuting the claims of Dr. Holly. Ironically, a Q&A article from this edition entitled “The Conscience and the Craft: Questions on religion and Freemasonry” provides discerning Christians with further evidence that the Masonic and Christian worldviews are incompatible. Many critics of Freemasonry, such as Holly, contend that Freemasonry is a religion in and of itself and therefore is incompatible with Christianity. By definition, practicing a religion other than Christianity is idolatry and practicing Christianity in conjunction with an additional religion is syncretism. Given that Freemasons build “temples”, pray in their lodges to “The Grand Architect of the Universe”, and engage in spiritual ceremonies such as funeral rites, there is a strong argument for concluding that Freemasonry is a religion. If Freemasonry is a religion, then participation in it is inherently sinful and Christians must not practice it. If Freemasonry is a religion, then it’s just plain idolatry. But is Freemasonry truly a religion? A member of any religion may apply for membership in the Masonic lodge. Thus worldwide Masonic membership can include men of Christian, Islamic, Jewish, Hindu, Buddhist, Mormon, and Deist faith. Masonry, therefore, not only “encourages” the worship of Christ but false gods such as Allah. All worship that is not Christian worship is counterfeit worship. Freemasonry encourages and does not oppose such worship. Jesus Christ said, “He who is not with Me is against Me; and he who does not gather with Me scatters. (Matt. 12:30)” A Christian can never countenance or encourage false worship. For American Christians, it is one thing to respect the constitutional right of Americans to religious liberty but quite another to encourage a non-Christian to engage in religious activity that is offensive to God. Christians are commissioned to call all men to repent of their sin and submit to the Lordship of Christ. The Christian posture is one opposed to all religions except that of Christ. This is not the posture of the Masonic lodge, which not only peacefully tolerates false religion but encourages its practice. Christian Freemasons, rather than merely passively supporting religious liberty, actively seek membership in an organization that encourages any form of monotheistic religious expression. The Apostle Paul condemned idolatry in his epistle to the Romans. Paul not only condemned idolaters but those who gave approval to idolatry. Freemasonry is either a religion and is, therefore, idolatrous, or it is not a religion but encourages the practice of false religions and the worship of false gods. Neither option is acceptable before the true and living God. Christians should, like James Holly, endeavor to purge their churches and denominations of Freemasons. Christian Freemasons should repent of their participation in Freemasonry and remove themselves from the Lodge. James Holly was voted out of his own local church for his biblical stand. Like Holly, Christians who follow his example may be voted out of their own churches for calling Masons to repent. Many Freemasons are respected members of Southern Baptist Churches, even Deacons. Bringing up the Masonic issue may cause division or even a church split. So be it. Such may be the cost of revival. Next story Worshiptainment, Worshiping the Right God In The Wrong Way!